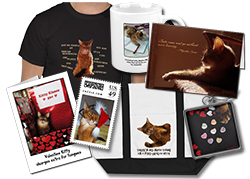 You are here: Home / Kitty Wisdom / What a Treat – Innova Coupon Giveaway! What a Treat – Innova Coupon Giveaway! 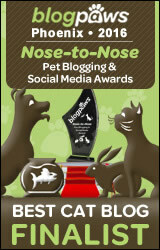 This is the sort of thing you sometimes get when you’re a pawsome cat blogger! The Innova humans sent me this elaborate promotional package, hoping that I would write something about it. Well, look at it — how could I resist? So let’s peek inside. There is all sorts of nicely-packaged information about the Innova brand, including a USB key with press releases and promotional art! Plus a food measuring cup — and treats! Wait a minute! How come the bag of dog treats is so much bigger than the cat treat bag? I say no fair! But I’ll take that up with them later. There are several reasons they sent me this package: 1) to make sure everyone knows that Innova products are now available in large pet store chains, not just small retail pet stores; 2) to assure Innova fans that even though they are now aligned with a big corporation (Procter & Gamble), they are still making their wholesome, holistic food the same way they always were, in the same facilities; and 3) to let those who are new to the brand know about the high quality of their food. As for the latter, Caren and Cody of Cat Chat did a great job of explaining it (they also got a box). I know what you kitties really want to hear about: do these treats taste any good? Well, let’s find out! The moment my human tore open the bag, look who showed up? She wasn’t even in the room a moment ago! My human threw a few treats across the room to get Binga out of my way so I could have a taste without her interference. These treats are totally tasty! I guess the dog liked her treats too, but I wasn’t paying attention. Plus the box is a fun toy! Now for the coupons! The package included three of them — you can get a whole 6.6 lb. bag of Innova food for free! Just comment below before 11:59 p.m. tonight, Pacific Time, and I will randomly pick three winners (U.S. or Canadian commenters only, unfortunately). The Innova humans even included stamped envelopes so all my human has to do is scrawl your address on them and drop them in the mail! It’s all totally quick and easy! So leave me a comment and good luck! Disclosure: Other than the yummy cat treats, Innova did not compensate me for this post. Like I care about green papers anyhow! And my opinions about the treats are definitely my own! We want to thank you so very much for coming by and posting such sweet things on our blog. Jack’s passing has been a hard time, but with everyone’s support, we are doing better every day. Baby definitely misses her companion of 15 years, but with special attention, she is pulling out of her grief. That looks like a great package! My cats haven’t tried Innova yet, but I’ve heard really good things! Loved your review!! I think we both reviewed it on the same day! Wasn’t that box just catabulous???? Cody can’t eat Innova (allergies) but…they were kind enough to email me some suggestions of what he might be able to eat from their sister company California Naturals…it is looking like it just might work! What a great story and pictures today! Our adopted mommy takes care of us….Bear is the oldest cat. Then a new family: Dollie,Peaches,Snowy,and Boots moved in….they are all males. THen Our Mommy,Patches, had a new family at the end of March: Sonny,Frosty,and Jeremy. Mean neighbors must have caught our sisters Chad and Cher in trapping cages in their backyard. Anyway, Mommy Lee here takes care of us—-all INside the house for fear of any of us getting caught by mean people outside. She has her hands full with the8 of us and could really use your free bag of goodies!! She is still job hunting…she wishes she could find cheap-cost of spaying for us—she says that would be a good thing….we say “neuter the boys, not us!). Oh, whew, I made it in time! I’m not so much of a treat man myself, but I’ll bet the food is yummy! We like the Innova foods…and we would love to try those treats! Please enter us in the giveaway!! My Mom just let me try some Innova that she got with a coupon in the newspaper. I loved it so much that I licked it straight from Mom’s hand. Good to know those treats are good! I am always looking for good treats! Don’t worry about those dogs treats at all though. Dog treats are never as tasty as cat treats. Dogs everywhere are jealous. Looks really good. The box could be a lil larger, tho. Purrs. Gosh, that really does look like good stuff. We sure would like to win that since we do have both dog and cats. Please put our name in the pot. Thanks for having this. I have to agree with Sparkle on the boycotting deal. They aren’t the only company that uses animals for testing. Just need to figure out a way to stop the animal testing for find some other means of testing things besides using animals. I hate to bring this up, but aren’t we supposed to be boycotting Proctor & Gamble products because they test on animals? Just meowing. I’ll not be entering. My human actually thinks about this sort of thing a lot, and when it comes to P&G, she does not think a boycott can be truly effective – their business is spread out into too many areas, and they seem to have a hand in just about everything that comes into homes. There are just too few boycotters and too many products to make a dent. She thinks the best thing to do to stop animal testing is through a movement to outlaw it (for every company) through legal means. It would be a long process and hard fight to work a series of bills through the legislature, but ultimately it’s a more winnable war than boycotting some products of a multinational corporation. Love your blog! I have 5 kitties and no doggies. Beasley (spoiled rotten boy), Princess (beautiful lady, acts like a princess), Queenie (she thinks like she owns the place), Fluffy (a big, silly lover girl) and Bugs (the instigator). I’m just their care-taker. That’s cool, Sparkle. And what a great box! We’ve had the Innova treats before and and thought they were really yummy. We don’t eat dry food so please don’t include us in the draw. Good luck to the other kitties! As much as I love Fancy Feast wet food, the Fancy Feast dry doesn’t agree with me. The Innova sounds healthy and tasty. So please, please, please enter me in the coupon giveaway so I can win. As much as I love Fancy Feast wet food, the Fancy Feast dry food don’t agree with me. My human Mom would love me to try Innova, sounds healthy and tasty!!! i would love a bag of innova food to take to the cat shelter i work at! I don’t know why the dog treats bag was so much bigger than the cat treats. That seems unfair. Innova should bring back the wet food with the blue label – don’t know what it was but it was yummy! PS – you don’t hve to enter us in the draw Sparkle, we only like gushy food! We totally want to enter…if YOU scarfed down the treats they MUST be tasty! You don’t have to enter me in this giveaway Sparkle – the Farm cats got their own special box and will be giving away some Innova themselves. Harry the Farm cat actually STOLE Sherpa’s bowl of Innova. We got the same box and coupons that we’ll be posting about but Sparkle, you have clearly outdone the photos our mommy took! We need a new pawsistant. Darn diets! But someone will be very happy fur sure! That box looks like it would be fun to sleep in!! Mom buys me those treats, and they are very tasty!! Ohhh enter us in the drawing please, we would like to try this food. Woohoo – a food giveaway. Now who doesn’t like to eat and try things! You can enter me in your contest pal. Thanks. Sweet Pea and Gabriel have tried those treats and they love them! They look really delicious and Samson is eyeing the box! Why never have good diet food like yours here , I might do diet better than this ! Innova should totally make the box a size for a sleeping cat, it would be a great advertisement if you could use it for sleeping. Those treats sure look tasty.